Few events in America have had the impact of the California Gold Rush and the desire to have a better life; an event that lasted seven short years. The Gold Rush swelled the population of California by the hundreds of thousands. And, it was all for the little flecks of gold that shone so brightly. People rushed in from all over the world. Did it beckon your ancestors, too? This was presented to a live webinar audience on October 17, 2018. 1 hour 28 minutes, plus 4 pages of handouts. The recording is also included as part of the monthly or annual membership. Always LOVE Miss Peggy.............Thank You!!! Excellent. Hope I can find some CA bound ancestors to research. Extremely informative and excellent syllabus too! Fabulous presentation with great resource information! Fantastic webinar with lots of great detail and information for future research. fascinating topic well presented. I didnt want this one to end! Good webinar, thank you. Gave me more ideas for researching my ancestors who were in California. Great storytelling and excellent resources to discover as usual. 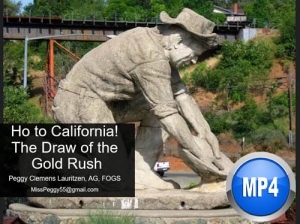 Great webinar on the California Gold Rush and the documents we can look at. Had interesting info in Nebraska, too! Thank you for such a wonderful webinar! I always love hearing from Peggy. She is a great presenter. I especially enjoyed the presenter reading from the diary with pictures she chose to accompany it. I love listening to Peggy on just about any topic! I was born and have lived in California all my life. I'm a retired teacher and have taught the gold rush. I really appreciated you pictures and information. It was very informative. I would rate her a 10 if I could. Her webinars are always interesting and well researched. She's great! Peggy...thank you for the 'step back into time'! Interesting. Gave me ideas for further research of my ancestors who came from ME to CA in 1859. Love her descriptive and exciting presentations. Miss Peggy is always great to listen to. More, please! Love Peggy. Her knowledge, her voice and I could listen to her all day! Nice presentation. I learned about a topic and area I have never researched in. Peggy always personalized her webinars beautifully & has plenty of detail in the outline. Always wonderful. Peggy is a very interesting lecturer. I especially enjoyed all the pictures she included about the migration and settlers in California. Peggy's talks are always great. I had been expecting more info on how to search for 49ers, but really enjoyed hearing about the individual experiences she highlighted. Really interesting info on new to me sources. she was easy to understsand and very well organized. SO interesting! Provided me with an enlarged perspective on the Gold Rush. The format for this webinar was particularly engaging. The presenter showed maps and scenery as she read excerpts from a diary of a man traveling to the California gold fields. This was so loaded with useful information. Thanks. Very interesting and helpful! Thanks! 74 of 100 people have found this review helpful.